Immaculate family home on open space offers year-round stunning mountain views! 2-story great room features lustrous hardwoods, built-ins and 2 tiers of picture windows framing the Rocky Mountains. Hardwoods continue into kitchen, which boasts granite counters and a double oven. Kitchen opens to family room with fireplace and ceiling fan, and more dramatic views. Home office space on main level. Master suite has luxurious 5-piece bath. Upstairs bedrooms are serviced by 2nd full bath with double sinks. Convenient upstairs laundry. 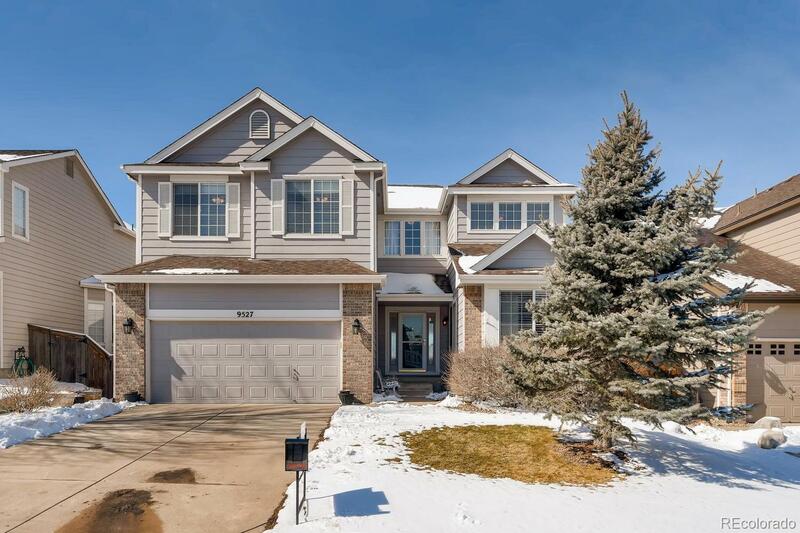 Full finished basement provides expansive flex space with ample built-in storage, another bedroom, and 3rd bathroom. Back yard abuts open space and connects to walking path. Spectacular location just steps from Redstone Park. Walk to Shea Stadium, batting cages, skateboard park, & baseball. Walk/bike to schools. Community features 4 rec centers with pools, fitness & tennis, plus miles of trails. Treat yourself to glimpses of wildlife and priceless sunsets!